The easiest mashed potatoes ever, with no last minute fussing! These Slow Cooker Buttermilk Mashed Potatoes are super delicious and can be made a few days in advance. Hosting a holiday meal with lots of family and/or friends in attendance is a bit of a juggling act. All those details can make my head spin! So I love having a few tricks up my sleeve – the kind that help me prepare key components of the meal in advance. Last minute stress is reduced, which allows me to enjoy my guests, instead of running around like a crazy woman! These Slow Cooker Buttermilk Mashed Potatoes are super delicious and can be prepared up to a day or two in advance. Then just let the slow cooker rewarm them before serving, leaving one more burner free on the stovetop. Who doesn’t want a trick like this in their entertaining repertoire? I read an article years ago about a famous restaurant in San Francisco called The Zuni Café. There was a quote from the chef, Judy Rodgers, that I found fascinating. She said that whenever buttermilk mashed potatoes were on the menu, whatever they were paired with, was the first thing that sold out. I decided to try buttermilk in my mashed potatoes and I’ve never looked back. Buttermilk has always been quite magical to me in both baking and cooking, and it definitely enhances the flavor and creaminess of mashed potatoes. 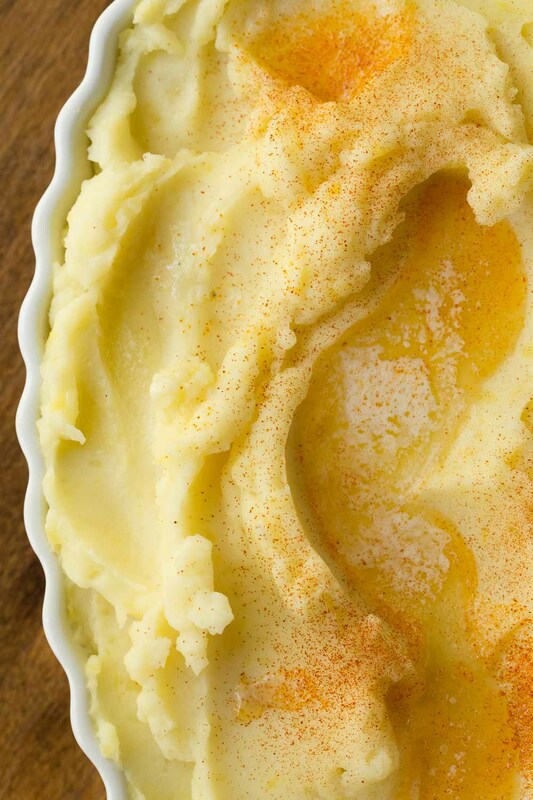 The easiest mashed potatoes you’ll ever make! 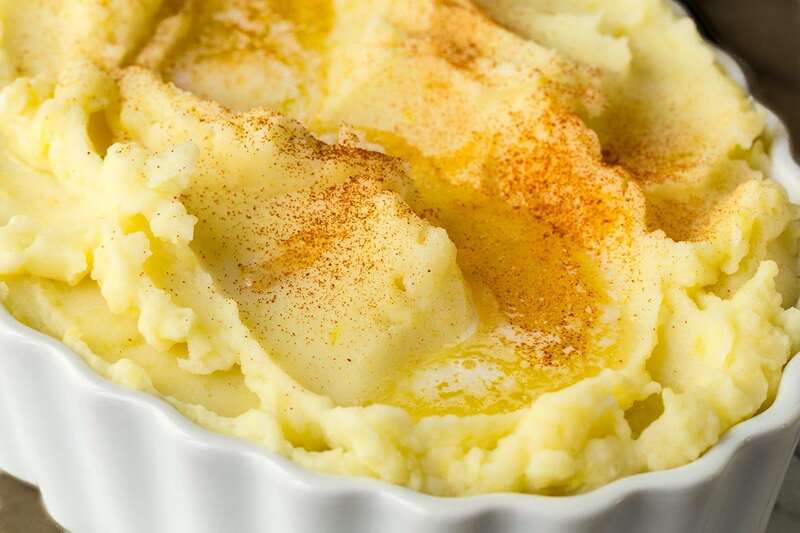 Although mashed potatoes aren’t difficult to make in the traditional way, they can be a little tricky to get timed just right. Especially if you’re trying to coordinate other components of the meal. There’s also the problem of keeping the potatoes warm until it’s time to serve without scorching on the bottom or having them dry out. 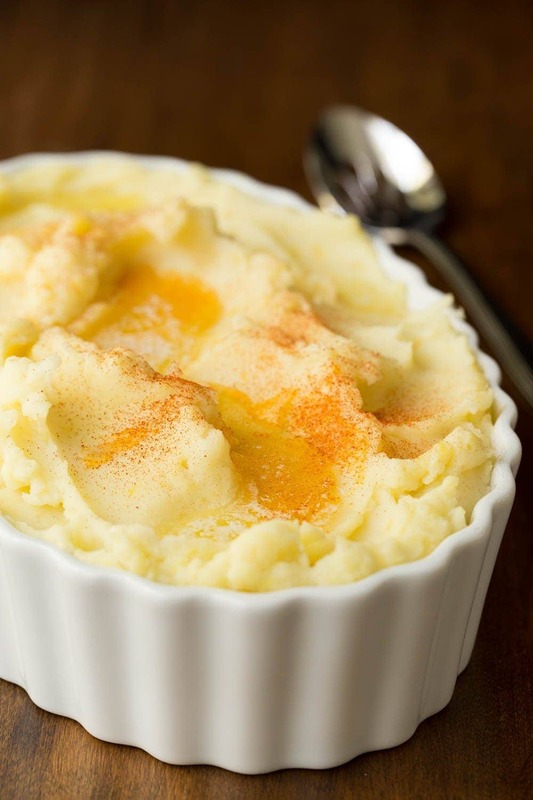 With Slow Cooker Buttermilk Mashed Potatoes, these problems are totally eliminated! Yay! Indeed, the slow cooker is quite amazing when it comes to mashed potatoes. How does it work? Just peel and cut up your potatoes then add them to the slow cooker with chicken broth and water. Cover and cook until they’re nice and tender, drain well, then add the good stuff; buttermilk, milk, butter and salt. Mash the potatoes right in the pot and keep them warm till you’re ready to serve – even if it’s several hours! Whenever you’re ready, your potatoes will be too! 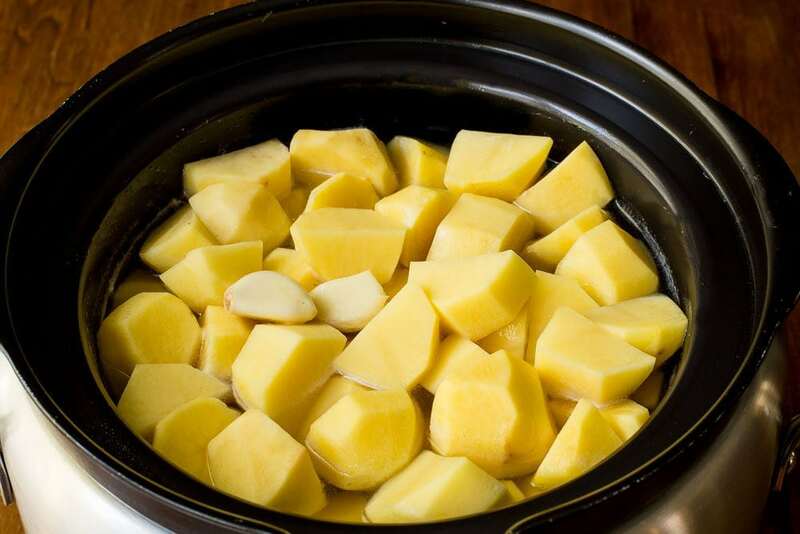 Every slow cooker is a little different as far as cooking times, so check the potatoes often during the last hour. You may find you need more or less time than specified in the recipe. For creamy, lump-free potatoes, you want to let them get nice and soft, almost to the point of falling apart. The recipe calls for chicken broth and water. The chicken broth adds flavor, but you could also use vegetable broth or all water. Make these mashed potatoes up to 2 days in advance, then cool and refrigerate. Place the cold potatoes in the slow cooker on low, 1-2 hours before serving. Once the potatoes are warmed through, check the consistency. Add more milk, a few tablespoons at a time and stir, until desired consistency is reached. Keep warm (on low setting) until ready to serve. For garlic mashed potatoes, add 2 cloves of garlic with the raw potatoes and broth. They’ll be super soft and will blend right in with the potatoes when mashing. For an attractive presentation, place potatoes in a serving bowl and swirl the top with the back of a serving spoon. Dot with butter and sprinkle lightly with sweet paprika. I love my KitchenAid Multi Cooker. 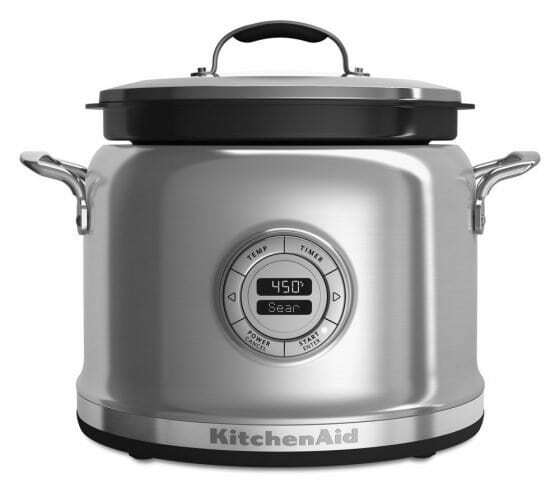 It’s a slow cooker, but also has settings for keep warm, simmer, boil, sauté and sear. That means you can do just about anything in it, including browning meats and poultry to keep them juicy before slow cooking. With most slow cookers you have to do that in a separate pan which, to me, defeats the easiness of slow cooking. With the Multicooker, you can do it all in this one beautiful pot. Have any cooks on your holiday gift list? This would be a one of those wonderful gifts that keeps on giving, all year long! Who knows? You might even be one of the recipients of something delicious, like this Slow Cooker Pasta e Fagioli Soup! I love making your (and my) life easier and less stressful. These delicious Slow Cooker Buttermilk Mashed Potatoes will receive rave reviews, and give you those extra minutes to enjoy your guests! You might even be like me and wonder, why in the world you didn’t figure this out years ago! 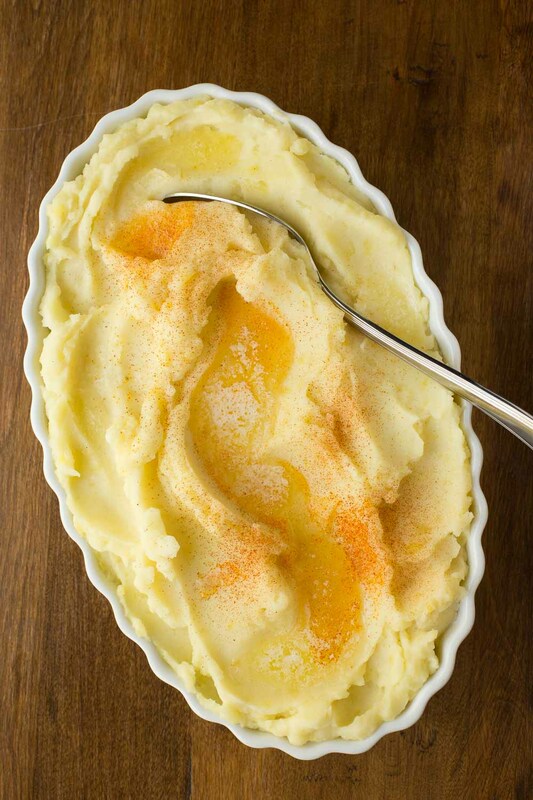 The easiest and most delicious mashed potatoes ever with no last minute fussing! Make them up to two days in advance! Place peeled potatoes, garlic (if using), chicken broth and water in the slow cooker. Cover and cook on high for 2-4 hours (depending on how fast your slow cooker cooks). You want the potatoes to be very tender (just about falling apart). Drain well in a strainer and shake the strainer a few times to remove excess liquid. Return to slow cooker. Lower setting to Lo, but do not turn slow cooker off. Allow to sit, uncovered for 2 minutes, then add butter, buttermilk, 1/2 cup milk and 1 teaspoon salt. Mash well with a potato masher. Add more milk as needed to make a nice creamy, but scoop-able consistency. Taste and add more salt, if need. To make ahead, follow directions 1-3 above. Allow to cool then transfer to a storage container and refrigerate for 1-2 days. To rewarm, transfer potatoes to slow cooker at least one hour before serving. Add 1/2 cup milk and and adjust heat to low. Allow to warm for one hour or more. Stir well and add more milk if needed to reach desired consistency. See Café Tips above in post for extra instructions and tips. I am used to attending turkey dinners where everything has to be done last minute. I hosted our first turkey dinner with family this year and my mother couldn’t believe I didn’t need help. These potatoes were delicious and a perfect addition to the no-stress dinner that we pulled off with nothing needing to be done just as the turkey was coming out of the oven. Thanks for the recipe. Now to find more recipes for the leftover buttermilk! I love it, Tara! That’s my goal; to make life in the kitchen easier and more delicious! Next year, try the gravy, it’s also a major stress reliever! 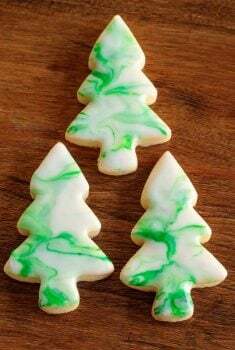 I made these yesterday. Absolutely delicious! I LOVED having relative peace in my kitchen and HOT mashed potatoes on my table. This will be a go to for years to come. Thank you! That’s wonderful Meg, thanks so much for letting us know! Zuni cafe was a favorite place of mine. Haven’t heard that name in years! Onward w/buttermilk ready to go! Hope you enjoyed them, Patti! How perfect is THIS! One less thing on the (already packed) stove! The mashed potatoes always seem to be put off to the last…MAYBE I can sit with everyone else at the table this year. 🙂 THANKS!!! Making mashed potatoes in a crockpot makes perfect sense. So often my mashed potatoes are fine when first made but after siting a while they’re not so great. I love this idea, thank you! Hi Chris, quick question- when you add milk for reheating, is that more buttermilk or regular milk? 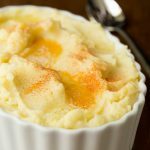 Mashed potatoes are a must have for Thanksgiving and I love how you have made them even more delicious. Thanks, Chris! I love the tangy buttermilk in these potatoes Chris! And I love that this recipe is for the slow cooker. We all know how we fight for oven space for the holidays! Pinned! Just in time for Thanksgiving, thank you Chris! I must try this, amazing. Chris, I love the white, ribbed oval serving dish for the mashed potatoes…where did you find it? Hi Karen, I actually found that dish in an antique shop although I don’t believe it’s old. What a perfect recipe for this time of year! 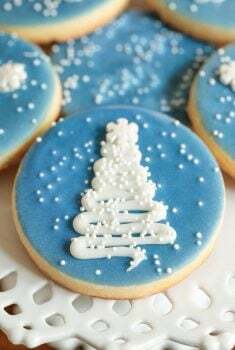 I love this idea and am fascinated with the addition of buttermilk. Outstanding Chris! Who knew mashed potatoes could be so effortless! These look perfect! It’s been eons since I’ve added buttermilk to my mashed potatoes, but I remember the boys loving them. Time to shake things up a bit—and this lighter version without cream and sour cream is easier on the waist-line, too! Our daughter-in-law made mashed potatoes in her slow cooker one Thanksgiving several years ago. Till then, I had never heard of doing this. Makes me wish I still had my show cooker! These are the yummiest looking mashed potatoes I have ever seen! I’ve never tried using buttermilk in my mashed potatoes but I will this year! Thank you for that wonderful tip, Chris! 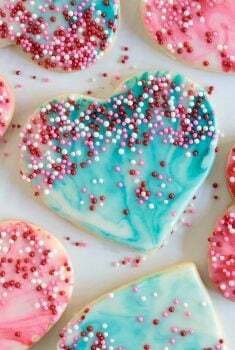 Oh man these look incredible, I want to dive right in, sharing today! I’m so happy you posted this recipe, Chris! I’ve never had buttermilk mashed potatoes but will definitely be making these this season. Any thing that can be done ahead of time just makes it easier to focus on friends and family when the big day comes! I’ll try w/ buttermilk..I change/ vary what I put in but always a treat. It amazes me how you know everything in your recipes..the nutritional values etc..you really are extraordinary.Bon weekend! I’m always happy when the Summer/Fall hiking/USFS season is over (because we hand over the our mountains to the hunters) and I can spend more time in the kitchen and catching up with my food blogging friends. I’ve enjoyed seeing your fabulous recipes roll by on my screen the last few months and now have time to re-visit some favorites. This mashed potato recipe is wonderful in so many ways. I have never successfully conquered mashed potatoes in the slow cooker. Then again, I’ve never included buttermilk in the recipe. So, I will give that a Go over the holidays. (BTW, I use Buttermilk often and just included it in a pumpkin spice bundt cake I baked). I also might add, a little grumpy here, Chris, that this post of yours might be very expensive for me. I also have googled your Kitchen Aid product and think it’s something I might need. Glad to be back visiting the Café. 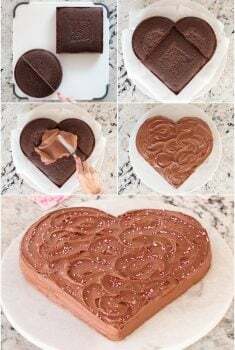 Easy peasy and so smooth and delicious!